Advisers to US President Donald Trump have tacitly approved Taiwan’s request to purchase more than 60 upgraded US fighter jets F-16, the South China Morning Herald quoted sources as saying Friday. The sources claimed that the request for the F-16s also included the one pertaining to mobile armour. The White House declined to comment on the matter. Chinese Foreign Ministry Spokesperson Geng Shuang meanwhile warned that Beijing opposes “the sale of any American weaponry to Taiwan”. “This is a clear and unchanging stance by Beijing, and we have already made a strict submission to Washington in this regard”, Geng said. He urged the US to adhere to the One China principle and three joint US-Chinese communiqués, adding that “the US should stop selling arms to Taiwan, interrupt any military contacts and interaction with the island nation so as not to harm China-US cooperation in key areas, as well as maintain peace and stability in the Taiwan Strait”. 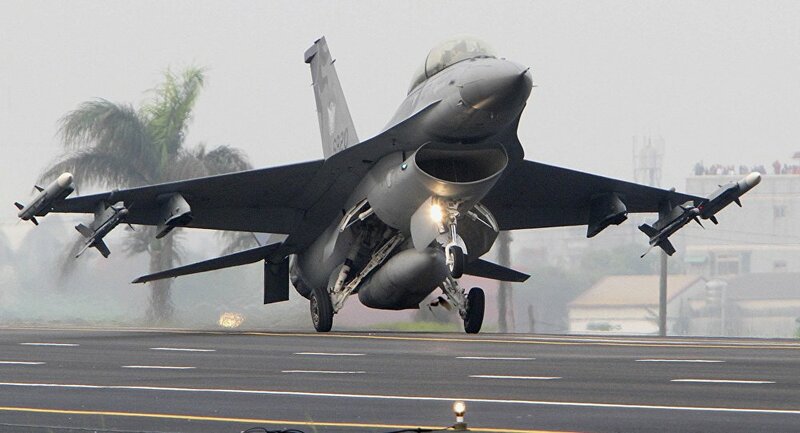 The development comes after Taiwanese Deputy Defence Minister Shen Yi-ming said earlier this month that in late February, his ministry submitted a broad and nonspecific request to Washington for new and advanced F-16 fighter jets to boost Taiwan’s defence capability. In a separate development this month, Maj. Gen. Tang Hung-an, heads of the Taiwanese Air Force Command Headquarters Planning Division, said that "the F-15, the F-18, the F-16 and even the F-35 [warplanes] are all among our options, as long as the jets help to strengthen our air defence capabilities”. Taipei asked to buy new General Dynamics F-16s back in 2011, but was at the time rebuffed by the Obama administration, which instead opted to help Taiwan refurbish its existing fleet of F-16A/B variants — the earliest versions of the aircraft, dating to the 1970s. The latest move comes amid Washington’s ongoing trade spat with Beijing that was triggered when Trump announced in June 2018 that $50 billion worth of Chinese goods would be subject to 25 percent tariffs in a bid to fix the US-Chinese trade deficit. Since then, the two countries have exchanged several rounds of trade duties against each other, but in December, Trump agreed to postpone increasing the tariff on $200 billion in Chinese imports to 25 percent, initially planned to go through on 1 January. The US, along with many other countries, does not recognise Taiwan as a sovereign nation and officially sticks to the "One China" policy. Even so, Washington keeps informal relations with the island nation after severing diplomatic ties with it in 1979. US President Donald Trump was the first president since Jimmy Carter to directly speak with the Taiwanese leader in 2016, and a year later, the US Congress passed the 2018 National Defence Authorization Act which authorised naval cooperation between the US and Taiwanese militaries.